The natural mineral sulfur is sometimes taken orally or used topically to help treat a wide variety of medical conditions. Topical applications of sulfur ointments or creams might provide benefits if you have a skin condition such as acne, eczema or psoriasis. Consult your physician before using any sulfur product on your skin to discuss the potential health risks and proper application. Sulfur is an essential mineral that plays an important role in the health of connective tissues, as well as skin, bones, teeth, hair and muscles, says the University of Michigan Health System. Sulfur also helps in the metabolism of fat and regulating blood sugar. You can get sulfur from your diet, particularly from eggs, meats, fish, garlic, onions, dairy and beans. Topical sulfur is most commonly used to treat skin-related conditions and is sold under the brand names of Acnotex, Sulforcin, Fostril and Rezamid, among others. Another form of sulfur called sulfacetamide is also used topically for the skin and marketed under brand names like Sulfacet-R, Clarifoam, Rosanil, Rosula and Plexion, notes the University of Pittsburgh Medical Center. Sulfur has several potential uses for skin health. Dermatologists sometimes recommend topical sulfur ointments for treating acne, seborrheic dermatitis, rosacea, eczema and dandruff. You might also use sulfur topically to help treat warts, pityriasis versicolor or skin discoloration, hair-follicle infections and shingles, says the University of Maryland Medical Center. Sulfur appears to assist in shedding excessive skin and fighting bacteria on the skin, explains the University of Pittsburgh Medical Center. For skin, sulfur products are usually topical in nature and not taken orally. You might use sulfur in the form of a commercial cream or ointment, or you might take a mud bath containing sulfur, a treatment called "balneotherapy," says the University of Maryland Medical Center. Sulfur is sometimes used in the form of dimethyl sulfoxide or "DMSO," which is absorbed through your skin. Other topical forms of sulfur include cleansers, gels, lotions and topical suspensions, notes the University of Pittsburgh Medical Center. 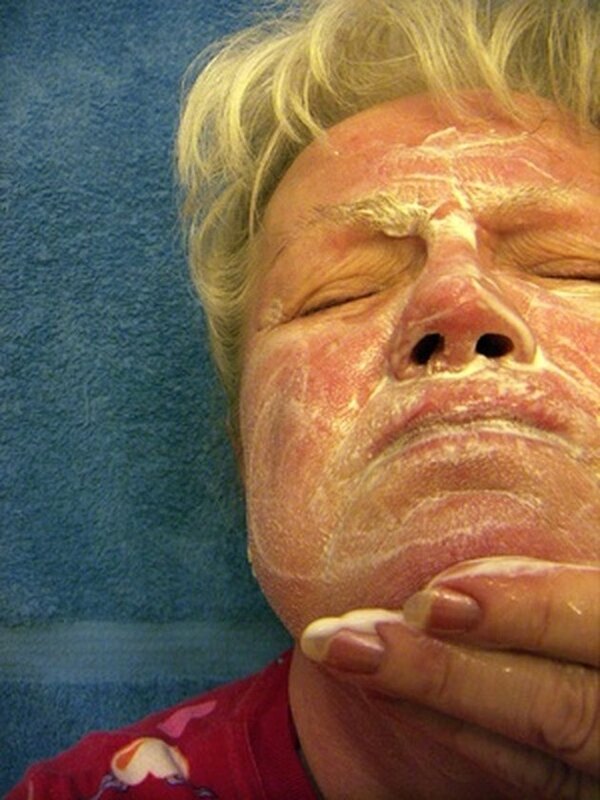 Follow your doctor's application instructions carefully when using sulfur to treat skin conditions. You might experience side effects such as skin dryness, itching, swelling and irritation while using sulfur to treat skin problems, says the University of Pittsburgh Medical Center. Applying sulfur to broken, wounded, sunburned or otherwise irritated skin can worsen the irritations. Don't cover the skin area with bandages or gauze after applying sulfur, because this could cause over-absorption. Don't use sulfur if you have an allergy to sulfur or sulfa drugs, or if you have kidney disease. Also avoid using sulfur topical products while using other acne treatments on your skin, unless your doctor says that doing so is safe. Topical sulfur might not be safe during pregnancy or while breastfeeding, cautions the University of Michigan Health System. Can Epsom Salts Treat Back Acne? What Are the Benefits of Sulfur Soap?